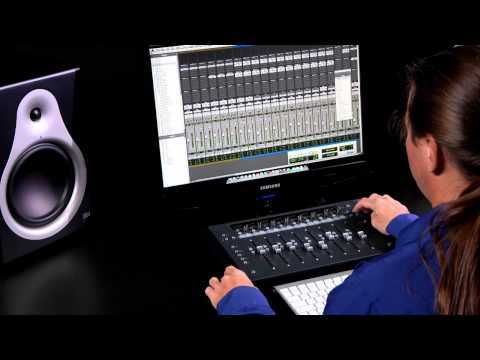 Why edit and mix one thing at a time with a keyboard and mouse? Artist Mix greatly accelerates your workflow so you can complete projects faster—without having to click around a software interface. Record-enable, solo, mute, and automate tracks from the surface. Adjust volume levels across multiple tracks simultaneously. Fine-tune compressors, gates, EQ, and more with a twist. You can even punch in and out of recordings by connecting a footswitch. No matter how large the session, you can easily get to the tracks you need directly from the surface. Bank through fader strips eight at a time. Or use the Nudge key to navigate through tracks one fader strip at a time. The surface also provides full transport controls. Not only do you get the usual suspects—play, stop, record, fast-forward, and rewind—but also RTZ (return to zero), plus previous and next keys to navigate markers. Control everything from panning and gain to plug-ins, EQ settings, and more using the eight press-and-turn knobs. With their touch-sensitivity, you can write automation quickly and intuitively. They’re also velocity-sensitive, enabling you to quickly sweep from minimum to maximum parameter values in one turn. Or make very precise adjustments by turning the knob slowly. Press the knob tops to instantiate plug-ins, sends, and more. Get accurate and smooth mixing control through eight motorized, touch-sensitive, 100mm long throw faders. Just touch a fader to select the corresponding track for editing. You can also lock individual tracks to faders and store them as Layouts—up to 48 per project—for easy recall, making mixing large projects a breeze. You can save multiple Layouts to mix groups of tracks, such as drums or backing vocals, or just lock a fader to act as a master fader. All Artist Series controllers are modular, so you can combine them together into a single slimline surface to suit your workflow. Connect up to one Artist Control, four Artist Mixes, one Artist Transport, and one Artist Color in any order for a total of up to 36 faders. Or use them separately, as each controller has its own Ethernet connection. Got an iPad? Download our free Pro Tools | Control iOS app for iPad and use it alongside your Artist Mix to work even easier. Like Artist Mix, Pro Tools | Control is powered by EUCON technology, enabling you to take control of your favorite audio and video applications. And when used with Artist Mix, you gain new touchscreen workflows, Soft Keys control, additional visual feedback, a counter display, and customizable layouts.